On the morning of our last full day in Israel, we hiked down to the Jordan River. The area we were in was above the Sea of Galilee and the river flows very swiftly there, even though it is only about ten yards wide. It looks a lot more like a mountain river here than the placid waters you see in so many pictures of the Jordan. It took some real effort just to get to the water’s edge. We went through lots of trees and over boulders on our way to the river. When we got to the river we sat on some boulders at the water’s edge and heard the Biblical stories that were centered around the Jordan River. 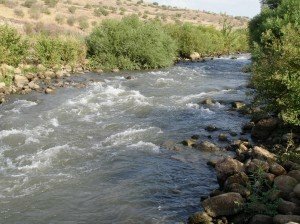 We were told the story of the Israelites crossing the Jordan at flood stage, by Jericho. Also, we heard the stories of John the Baptizer and that most of his ministry was done along the Jordan. The waters of the Jordan River always symbolized chaos to the Hebrews, because it was a barrier to be crossed and they were desert people and couldn’t swim. The last story we looked at was Jesus’ baptism by John which occurs in all four gospels (Matthew 3:13-17, Mark 1:9-11, Luke 3:21-22, and John 1:31-34). In all the accounts, when Jesus is baptized, the spirit of God descends on him and hovers over him like a dove. This is the same image and words used in Genesis 1, when the Earth was without form and void and the spirit of God was hovering over the waters. In both the Genesis and New Testament stories the world is in chaos until the Spirit of God enters from heaven and gives meaning to the chaos. As Jesus steps out of the water, God is commissioning him to enter the chaos and to make order out of disorder, just like God himself did at the creation. What is the faith lesson here? If we are honest with ourselves, all our lives contain chaos. We try to make it look like we are handling things well and we are usually unwilling to share our chaos with anyone. We are also usually not willing to enter the chaos of others, because it can be messy, depressing, and time consuming. The key to the Kingdom of Heaven coming on earth for us is to be willing to share our chaos and also be willing to enter the chaos of others. As we sat there on the river an amazing event took place. One person spoke up and shared with us some of the chaos going on in their life and asked to be baptized for repentance. An immediate response went out through our group and everyone began to share their own battles with the things that were troubling them in life. 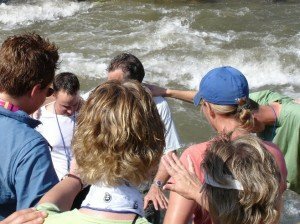 The whole group was baptized in the river and we ended up staying there most of the morning, sharing and comforting each other. It was a very emotional experience and one of the great community moments of the trip. Our group really bonded together that morning as we entered each other’s chaos. The Kingdom of Heaven came down to earth in our presence there on the banks of the Jordan River in the form of caring people that were genuinely concerned for their fellow man. The lesson we learned was that we have to be willing not only to open up to others but also be willing to step into the problems of the people around us. If we are to be like Jesus, we will have to have a heart for others just like He did. It is a daunting but tremendously rewarding task. Can we be so bold and caring that we are willing to enter into the chaos of life and help restore the order that only Jesus can bring? While we were in Israel we spent every day doing a lot of walking in the land, following our rabbi and learning with our feet as we walked. One morning, we walked from Nazareth, Jesus’ home town, to Sephorris (also called Zippori), a much larger city built about the time of Jesus by Herod Antipas. As we were walking cross country between the two cities, a distance of about three miles, we were led to an ancient stone quarry. The rocks that were cut out of this quarry were almost certainly used to build Herod’s nearby city. The New Testament describes Jesus and His father’s occupation in the Greek as “tekton”, which in English means,” a craftsman who builds”. Most translations render this as “carpenter”, however, if you have been to Israel, there is not much wood to work with. Even today, almost everything is built out of stone. It is much more likely that Jesus and Joseph were stone masons and were craftsman in that occupation. If this was true, then the quarry that we were in could have been worked by these two men and their relatives from Nazareth as they helped build the nearby modern city of Sephorris. While we walked through the quarry we learned how the stone masons used the natural fault lines in the limestone, iron chisels, and pieces of olive wood to take massive stones out of the bedrock. They would chisel a channel down into the rock and then fill it with olive wood stakes. The wood would then be soaked with water and allowed to expand. This would break the rock away from the quarry along the natural fault lines and the channels cut in the rock. These master craftsmen would then carefully chisel the stone to its correct shape to fit in its spot in the wall or building before transporting it to the job site. Many ideas have been proposed as to how they got these enormous stones – some weighing up to 100 tons – from the quarry to the job site and up on the wall, but no one knows for sure. 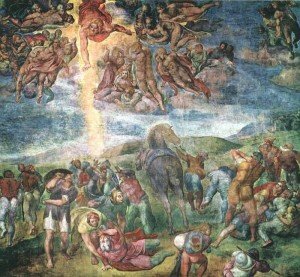 In Isaiah 51;1-2, God gives us the picture of His people all being cut from the same vast quarry. That quarry that we are cut from is our Jewish heritage! We all come from the same quarry as Abraham and Sarah, as well as the other famous Jewish forefathers, such as Isaac, Joseph, Moses Joshua, Deborah, David, Hezekiah Ruth, and the New Testament heroes like John the Baptist, Peter, Paul, John and others. Our roots are in our Jewish heritage and amazingly we are cut out of the same stones as they were! This picture of us all being cut out of the same rock is a powerful visual image and faith lesson. When we come out of the quarry, cut by the master craftsman, we are just a big ugly and useless stone. But in the hands of that master craftsman, He begins to chip and cut us into the shape that we need to be to fit into our place in God’s building. To be one of His disciples, you have to be willing to put yourself into the Master Tekton’s hand, with His hammer, chisel and saw, and let him shape you. It isn’t always nice or pretty and the chips and pieces fly as we are being fit for our spot in His plan for us. We have to be worked; the pieces aren’t just right and they need to be shaped. It often hurts when God is making us into the stone that He wants us to be! We love the Messiah part, we love being part of the building, but we don’t like the shaping and chiseling. Now, look at Ephesians 2:19-22. “Consequently, you are no longer foreigners and aliens, but fellow citizens with God’s people and members of God’s household, built on the foundation of the apostles and prophets, with Christ Jesus himself as the chief cornerstone. In Him, the whole building is joined together and rises to become a Holy Temple in the Lord. In him, you too are being built together to become a dwelling in which God lives by His Spirit”. In light of this image of the quarry and the stones, don’t these scriptures just jump off the page? Collectively, we are being built into the temple that God dwells in, by His spirit and He is constantly having to shape and chisel us to make us fit into His ultimate plan for us. We need to remember two things from this Isaiah passage and quarry story. One, if we are seeking righteousness and pursuing the Lord as Isaiah 51 says, then we need to look to our Jewish roots to find the answers to those questions. Secondly, we don’t have any excuse for not being what we ought to be. We have what it takes because we were cut out of the same quarry as those other great heroes of the faith. We have everything that we need to be a disciple of His. We just have to be willing to be faithful and diligent to do our part in the cutting and shaping process. Then we will fit exactly where the master craftsman intended us to fit and be that living stone that He intended for us to be.